Capitals fans cheer during the victory parade in Washington, D.C.
Washington Capitals fans cross Pennsylvania Avenue as they head toward the Stanley Cup victory parade route on the National Mall in Washington on Tuesday. Capitals forward and team captain Alex Ovechkin holds the Stanley Cup above his head during the victory parade. And how those long-suffering fans have waited for this celebration. As NPR has reported, the Capitals' championship is the team's first ever in its 44-year history and Washington's first in one of the country's big four professional sports leagues since its NFL team won the Super Bowl in 1992. Thursday also marked the 40th anniversary of Washington's only NBA title. They're showing up in commemorative Capitals T-shirts and carrying signs, flags and — of course — Stanley Cup replicas. "It's been a long time coming," said Zach Mondres of Virginia. He says he got to the parade "as early as I could." "I just love the Caps and want to be here for the experience and celebrate with them," Mondres said. "It's not even a huge thing just for a Cap; it's a huge thing for all sports fans in D.C."
Hayley Grinder, Zach's fiancée, says they've spent years "being frustrated" — cheering the Caps on, only to watch them lose. At 11 a.m. four F-16 Fighting Falcons from the D.C. Air National Guard kicked off the two-hour parade with a flyover. Then, at least half a dozen sightseeing buses wrapped in Caps imagery snaked through the winding path from Constitution Avenue and 17th Street NW to Seventh Street NW and the National Mall. 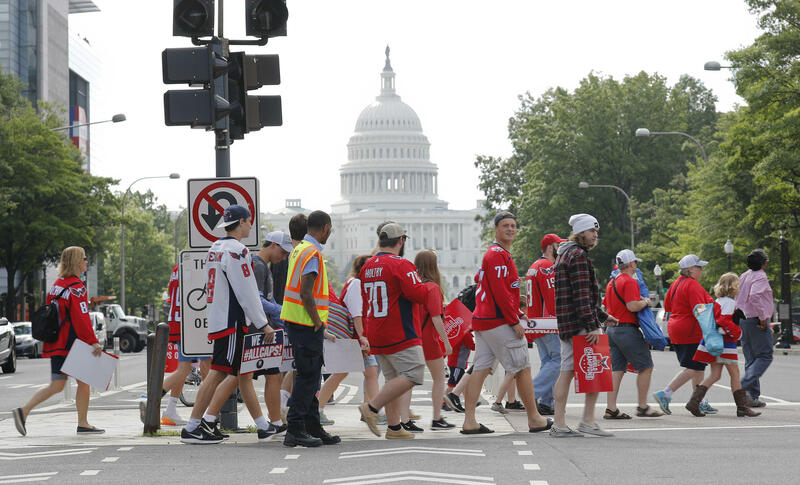 Capitals players were scattered among the buses. Other parade participants included two local high school marching bands, Capitals cheerleaders, and fans who have held Capitals season passes since the team's inception in 1974. 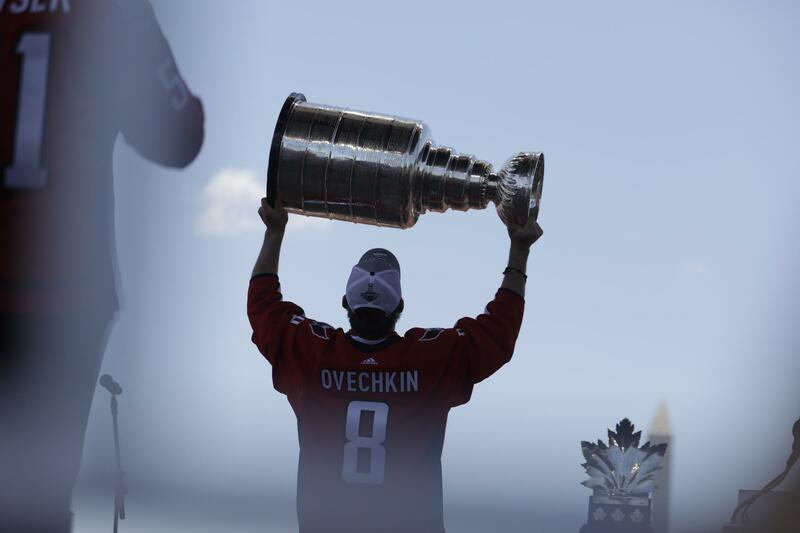 Capitals team captain Alex Ovechkin was the parade's finale, hoisting up the Stanley Cup while riding in one of the open-top double-deckers. The parade concluded in a rally, where the players were introduced. Ovechkin, whose name was called last, stood up to roars of praise from fans. D.C. Mayor Muriel Bowser also spoke at the rally. 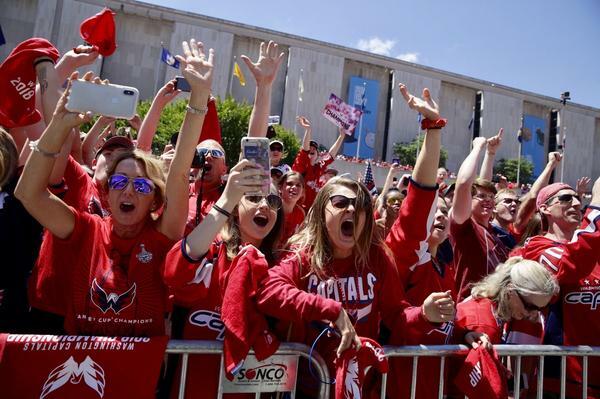 Caps radio announcer John Walton said the celebration was a win for the entire city. "Welcome to Washington, D.C. It is the most powerful city in the world. A symbol of hope and democracy and the home of the 2018 Stanley Cup champions," he said. "We're a part of history here today for the first time to gather to celebrate our town being at the top of the hockey world. The disappointments of the past [are] swept away by an extraordinary group of players who would not be denied a date with Lord Stanley."